A confrontation caught on camera between a Pennsylvania military veteran and a man dressed as an Army Ranger has gone viral with more than 1.5 million views since it was posted Sunday. Twenty-six-year-old veteran Ryan Berk, a Purple Heart recipient from Bucks County, was at the Oxford Mall shopping for Black Friday deals when a man dressed as an Army Ranger caught his eye. A vet himself, Berk said he was curious about the soldier and moved in for a closer look. He quickly grew suspicious after noticing small inconsistencies in the man's uniform, said Berk. After watching the uniformed man shop, Berk approached him, cell phone camera rolling, and introduced his son. "Hey buddy..." said the soldier. Berk quickly began firing off questions a veteran would likely know how to answer, including a question about the placement of a flag on his uniform. "Why's your flag so low?" asked Berk. "Ya got me on that one, bud," the man replied. At one point, Berk accused the man of violating the Stolen Valor Act, a law that makes it a crime to fraudulently claim to have received any military decorations with the intention of gaining money, property or any other tangible benefit. "His responses to my questions were just a dead giveaway," said the Bucks Co. vet. "Let me tell you something," said the uniformed man. "If I was a phony, I wouldn't be wearing this uniform." After another exchange of words, the man walked away, and Berk stopped the recording. Berk posted the video to YouTube Sunday hoping to shame the man, he said. The video quickly went viral, catching the attention of more than 1.3 million people -- including a local congressman who is now calling for a federal investigation. 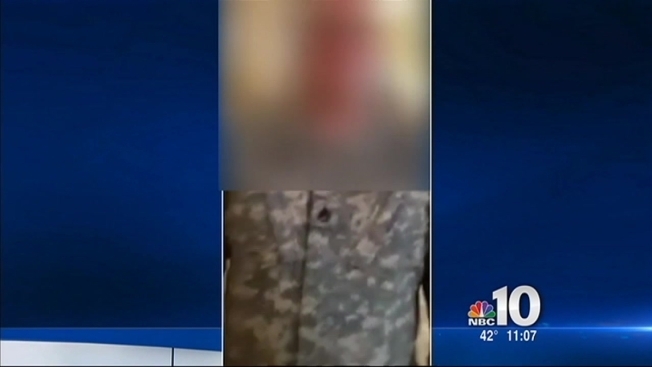 The U.S. military confirmed that they are aware of the video and the man, whose name is being withheld at this time, has no affiliation with the Army. "To have this guy then pretend that he's done the same thing on the caliber that my friends did, it just gets you infuriated," said Berk.